The tomato plant is one of the non-poisonous and edible plants of the Solanaceae or nightshade family. Its scientific name Solanum lycocarpum means wolf fruit and it comes from the fact that wild dogs in South America feed upon tomato plants. Tomatoes are amazing plants and is one of the many examples that God takes care of us by providing for us. That is demonstrated in the verse Matthew 10:27-31 where Jesus speaks of caring for us far greater than sparrows, yet He knows when each sparrow dies. 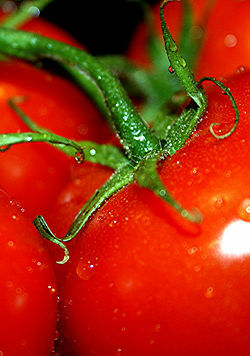 The Tomato was originally native from Central, South, and southern North America from Mexico to Argentina. 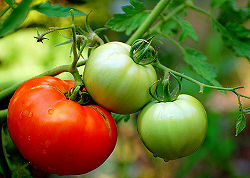 Tomatoes can grow in a variety of locations which makes it a good plant to cultivate. Today, Tomatoes are grown all over the world. China is the country with most tomato production following with the United States, Turkey, India, then Egypt. Tomatoe plants are perennials, which means they live for about two years. If grown outside it would be an annual, which means it would live for only a year. It can be argued if wether or not the ovary produced by the tomato plant is a fruit or not. Technically the red ovary produced by the tomato plant is the fruit of it. So it can be argued that the fruit of the tomato plant is actually a fruit. But a Supreme Court hearing ruled that the fruit of the tomato plant is actually a vegetable considering its use and to settle the matter of United States tariff laws placed on fruits and vegetables. So in botanical terms, a tomato is a fruit, but in culinary terms, a tomato is considered a vegetable because of its use. TOMATO Thomas L. Rost. UNIVERSITY OF CALIFORNIA, DAVIS. Tomato History Peggy Trowbridge Filippone. About.com. This page was last modified on 26 March 2009, at 18:45.